I think I'm still floating on cloud 9. Let me grab your hand and invite you up here with me lol as I share with you my experience. 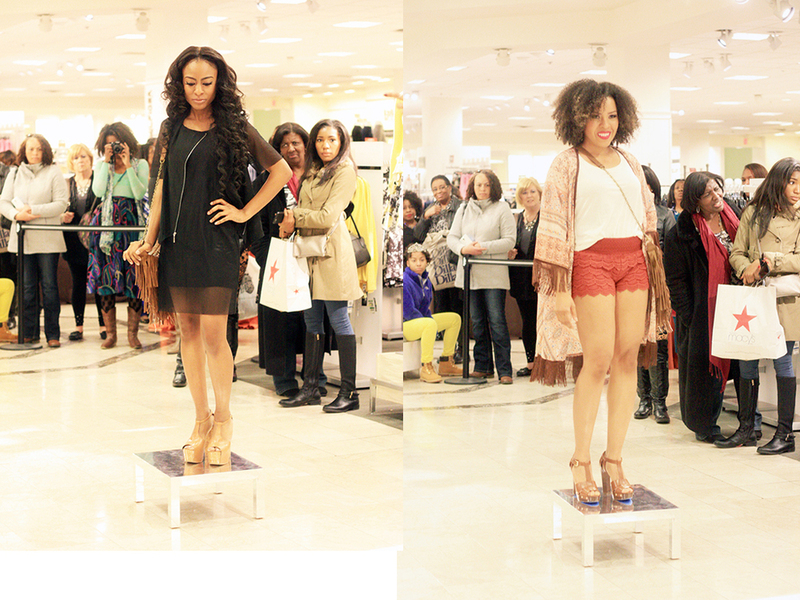 This past Saturday, I had the pleasure of celebrating Black History Month with Macy's Oak Court. I hosted and styled the Style of the Soul Era event with fashion and music from two of my favorite decades the 60s and 70s. FRIDAY 10:00 AM CALL TIME | As a stylist, your work begins days before the event. Pulling looks for the show, fitting models, editing down looks, and going over the day of logistics has to be done before the glamorous part. It is work. We all know there are many things that go on behind the scenes for just those few moments of a show. The looks would all reference the hottest trends from the 60s and 70s with modern takes from the amazing pieces in Macy's. My job was pretty easy. I walked all through Macy's like a kid in a candy store pulling fringe, patterns, sequin, bell sleeves, bell bottoms, platforms and so much more. The hard part was editing down lol. FRIDAY 5:35 PM WRAP UP | I had a few moments to endulge in a selfie and take it all in. All of the looks were pulled and we were ready to rest up for a great show. SATURDAY 1:00 PM SHOW TIME | It's show time baby!!! Time to groove on and celebrate The Style of the Soul Era with fashion and music by the incomparable Stax Music Academy faculty. 60s were all about fringe!!! Fringe on jackets, bags, cardigans... The looks I styled had a modern take on how to wear the fringe in your everyday wardrobe and all from Macy's. Oh yes... the 70s!!! Women were taking the dress to new lengths with bold prints. It was all about showing those lean legs. So sad to have to close out the show but we went out with a bang. Going back to the 60s trends we all know. Bell bottoms, jumpsuits and bell sleeves!!!!!! Man did I have a ball. I would like to thank Macy's again for having me. I think all of the fashion gods knew how much I love the 60s and 70s. All of the looks are shoppable still lol. Stop by Macy's Oak Court and recreate these styles from the Soul Era. It's pretty apparent you can groove through memory lane and not look like you literally are stuck in time. The key to making these looks modern is to use one key element or trend from each decade. Say reference fringe for example and your other pieces can be very current. Take the picture, screenshot the look or whatever you need to do. Have any questions or can't find the looks let me know and I'll be happy to help you search for them. Oh and before I go, Let's talk my look!!! I told you all I was going to reference "THE BOSS" Ms. Diana Ross. I designed this gold lame bishop sleeve dress with my style icon from the 60s and 70s in mind. I wanted the disco feel from the 70s. It was the only place during that time where everyone from all walks of life were welcomed and happy.